Students traveled across Boston to its Fort Point neighborhood to attend a BU Spark! workshop about interaction design Friday. There they delved into interaction design and explored how to develop user-friendly software. BU Spark! and Red Hat Inc. hosted the Interaction Design Bootcamp jointly at Red Hat’s Boston office. BU students and Spark! Interaction design fellows attended. Red Hat is a software company that specializes in information technology and has a research relationship with Boston University that includes educational elements. The programs taught by Red Hat focus on user experience design, one of Red Hat’s specializations, . User experience design, also referred to as interaction design, is a consumer-centric discipline in technology. It focuses on making technological products as intuitive as possible. There are many areas of interaction design, including visual, front-end development, user testing and research. Friday’s workshop focused on the intersection between computer science and graphic design. In the program itself, students used the design-thinking model to develop an on-campus laundry service. The design-thinking model, an essential element of interaction design, features five steps. First, the developers hone in on the needs of users and later define any problem customers face with the design. Then, they brainstorm solutions. The developers make a prototype of their ideas and move on to user testing. 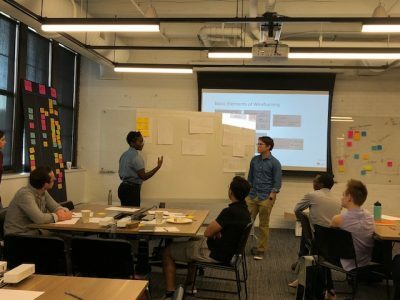 Ben Lague, a sophomore in the College of Arts and Sciences, attended the Interaction Design Bootcamp and said he appreciated the collaborative element of the workshop. After this collective brainstorming session, they began developing prototypes. Because the program was only three hours long, attendees didn’t have time to receive feedback and redevelop their products, but future sessions will enable that. Red Hat and Spark! will host three additional sessions where they will organize a product review clinic and form a career panel for students to learn more about interaction design professions. Both Natalie Wong, a senior interaction designer at Red Hat, and Ziba Cranmer, the director of BU Spark!, felt that this program was essential because of the applicability of user experience design. Cranmer emphasized the importance that technology remains accessible and consumable for customers.